Wolfgang Templin was a leading member of the democratic opposition in the last years of the DDR [Soviet East Germany] and has since then worked as a publicist, concerned with the history of the DDR, the former Eastern Bloc and German reunification. Politically, Wolfgang took part in the Round Table discussions and co-founded the IFM [Initiative für Frieden und Menschenrechte/The Initiative for Peace and Human Rights], Bündnis 90 and the Bürgerbüros zur Aufarbeitung von Folgeschäden der SED-Diktatur [The Federal Foundation for the Reconciliation of the SED Dictatorship]. 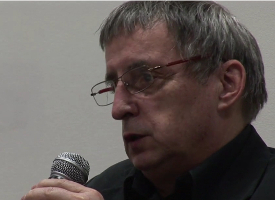 Peter has also been published in Grenzfall and worked as a researcher at the Berlin Wall Museum from 1994-96. He now works as the director of the Warsaw office of the Heinrich Böll Foundation and has twice been awarded for his work in European solidarity programmes (in 2009 by the Polish-German Society and in 2010 by the European Solidarity Centre), particularly in respect Polish-German relationships.